A while ago, I was asked to create a memorial for the Leicestershire town of Coalville to commemorate 100 years since the end of the Great War. 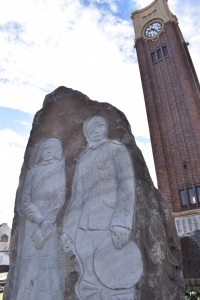 I worked alongside a local Heritage group and we decided that the sculpture would feature 5 figures representing occupations that played a significant role in Coalville’s contribution to the WW1 effort. The occupations we decided upon were a soldier, a nurse, a munitions worker, a miner and a textiles worker and we used photographic images from local archives as inspiration for each character. 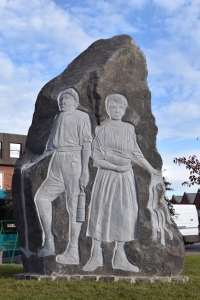 The heritage society wanted to highlight the significance of the input from the entire community as they all pulled together during this very difficult time. I used the local stone for the work, which was a very hard, but not unworkable granite from nearby Bardon. The block that I found was almost 3m tall and weighed around 6 tonnes. 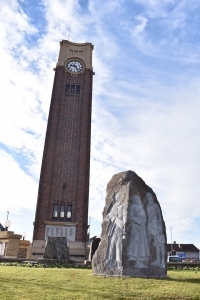 The WW1 memorial sculpture took around 2 months to carve and is situated in front of the newly refurbished Clock Tower in the Town Centre.